Arriving at camp this year with darkness nearing, we pulled our pop up camper up to the clergy cabin, also known as the hut of snoring, and began to situate the camper out of the way. Fr. Jonah’s joyful face appeared from his family wagon and he suggested that we arrange our camper to allow for a campfire. My wife loves campfires! In all the years attending camp we had always been to distracted or unwilling to put forth the effort needed to accomplish such a feat at the clergy cabin. Did I mention that my wife loves campfires! There already existed a fire-pit surrounded with Pennsylvania rocks and there was already a little dry wood sitting on the porch. And I also happened to bring by cordless circular saw along to add dry limbs to the burn pile. So, with a little effort and some camp chairs, we were set! At nightfall with flames jumping, thanks to Matushka campfire abilities, Fr. 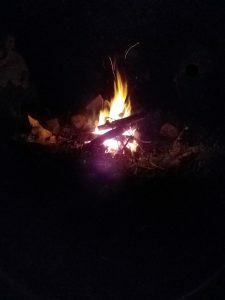 Andrei said: “There is something peaceful about watching the flames of a campfire.” We sat around the fire sharing our victories and struggles and a story or two. Seems like when I share my heavy burdens with my brothers, the load seems lighter! We sat around the fire as family. Orthodoxy is one big family. We sat around the fire watching the unharnessed flames dance about as the smoke ascended towards the stars. Back home now and back to the grinder of life I miss that time sitting around the campfire. It was a time to escape. It was a time to remember that my everyday hustle and bustle entices me to love myself more than others. And so on it goes, paying bills, going to work and all of these actions that have become distractions from what I was born to be, a lover of man-kind. We read in the instructions to the church in Hebrews, “Our God is a consuming fire.” [Heb. 12:29] And I remember how peaceful it was staring at the camp-fire but then I return to the world and fall into want. I seem to have assembled my life in a method of my control. Just as someone dipping his toe in the water to check the temperature, I have only allowed myself to admire the flames but not trusting God enough to be consumed in His fire! The church Fathers say that God’s fire is actually His love. When we chose to hate our enemies as we have seen recently in the news, we experience a negative aspect of God’s fiery-love. Hate is a four-letter word that will rob you of your salvation! But in His salvific love a Reformed pastor once told me that if you are on fire for Christ, people will come from miles around to watch you burn! Maybe my kindling is too wet for that to ever happen. Perhaps I hate myself and others more than I love God? I’ll have to take an inventory of my time and see how much effort I truly spend building His church! But maybe one day with the help of God I will become a burning bush of love with flames dancing about bringing peace to a world in turmoil, with a fire that cannot be extinguished!